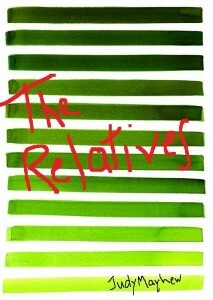 The new book I am reading for the remainder of October is titled “The Relatives” by Judy Mayhew. It was sent to me by Ms. Mayhew in August and it will be my first Kindle book. I am looking forward to reading this via my Iphone which makes the whole carrying a book around so much easier. The book tells the story of Marlene Montgomery who enjoys her position in the environmental industry and her freedom until she is informed that her ex-daughter-in-law has been shot in Toronto, Canada in a gang-related incident. Her son re-married, won’t come to rescue his kids by his first wife, according to Ms. Mayhew’s Web site http://www.judymayhew.com. Marlene is left to cope with two grieving young kids who have been home-schooled and steeped in religion. Instead of dating and vacationing in Peru, she finds herself dealing with baby sitters and day camps. I look forward to reading more about this story and I hope you all can read along with me. Ms. Mayhew is a wife, a mother, a grandmother and dog parent. She enjoys Indie films, libraries, coffee shops, New York, dark chocolate ,Bernese Mountain dogs, Van Morrison and Diana Krall. “I live where most people would like to vacation,” Ms. Mayhew says on her Web site. You can order her book on Amazon.com and visit her Web site at http://www.judymayhew.com.